The Maijuna, an indigenous group of the northeastern Peruvian Amazon, live in one of the most biologically rich regions of the world. Unfortunately, the Peruvian government wants to build a road directly through the heart of their ancestral lands, an area that they have cared for and lived in for millennia. The direct effects of highway construction and the associated impacts from an influx of colonists and subsequent deforestation would irreversibly alter the ecological fabric of this currently roadless area. Given that the Maijuna are a forest dwelling people who rely on the forest for sustenance and survival, building this road would severely impact their livelihoods and traditional culture. Help us tell the story of the last remaining Maijuna through the power of documentary filmmaking as they fight for their ancestral homeland and their cultural survival. This film is critically important because it will help to get the word out about the plight of the Maijuna and help them in their struggle to defend themselves. This is a joint project between Professor Michael Gilmore and students Tyler Orton and Will Martinez of George Mason University, documentary filmmaker Jacob Wagner, and the non-governmental organization Rainforest Conservation Fund. The project is currently seeking to raise $25k in funds through crowd-funding, and you can learn more about the project this article, and support it through the project’s Indiegogo page. I was delighted to receive via email yesterday a copy of a new collection of Máíhɨ̃ki texts compiled by Amalia Skilton, who was a member of the Máíhɨ̃ki Project fieldwork team in 2012 and 2013. Amalia began independent fieldwork on Máíhɨ̃ki in the fall of 2013, and since January of this year, she has been working with speakers of Northern dialect of Máíhɨ̃ki in the town of El Estrecho, located on the Peruvian side of the Peru-Colombia border. Northern Máíhɨ̃ki was historically spoken in the basin of the Algodón River (Máíhɨ̃ki: Tótòyà), a major southern tributary of the Putumayo River, and the remaining 13 speakers of this variety live either in the community of Tótòyà, located on the river of the same name, or have moved to El Estrecho to have easier access to education, work, and commercial products. Northern Máíhɨ̃ki was, until Amalia began her work, the least documented of the three Máíhɨ̃ki varieties (Western Máíhɨ̃ki, spoken in the Yanayacu River basin, Eastern Máíhɨ̃ki, spoken in the Sucusari River basin, and Northern Máíhɨ̃ki), but its small number of remaining speakers are considered by many Máíhuna to be among the most knowledgeable in terms of traditional culture, including oral traditions. Amalia has also found quite a number of grammatical and phonological differences between Northern Máíhɨ̃ki and the other Máíhɨ̃ki varieties which will no doubt lead to interesting insights into the history of the language as whole. 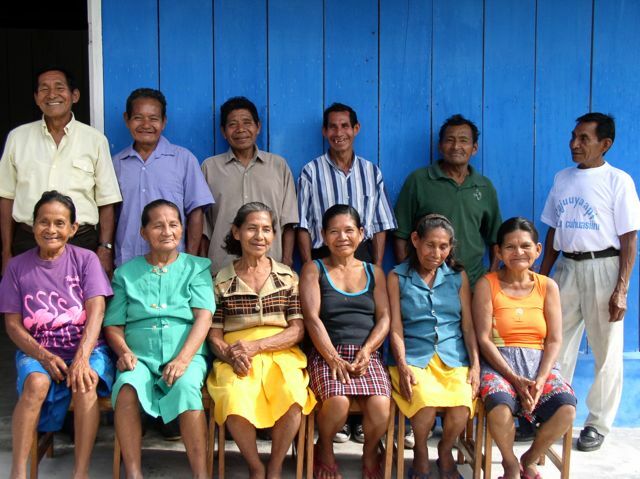 The text collection that Amalia has compiled for distribution to the Maihuna communities includes texts from majority of the speakers of the Northern dialect (Adriano Ríos Sanchez, Enrique Ríos Díez, Féderico Lopez Algoba, Lizardo González Flores, Otília López Gordillo, Pedro López Algoba, Soraida López Algoba, and Trujillo Ríos Díez), and includes illustrations by Gervasio López Mosoline. The oral texts related by these speakers, and transcribed and translated by Amalia with their help, are all fascinating, and exemplify a wide range of themes and forms of verbal artistry. Anyone with an interest in Tukanoan linguistics or Amazonian verbal art should check it out here (6.3mb)! I recently learned of David Fleck’s new monograph Panoan Languages and Linguistics, available online here through the American Museum of Natural History. Fleck provides an internal classification of the family, but perhaps the greatest service he has provided is to sort through the perplexing blizzard of Panoan ethnonyms one finds in the colonial and ethnographic literature, and in older classifications of Panoan languages. He also discusses language names that have been applied to both Panoan languages and non-Panoan ones (Katukina, anyone? ), which is another source of confusion. This is a very useful reference to anyone who engages, however briefly, with Panoan linguistics. 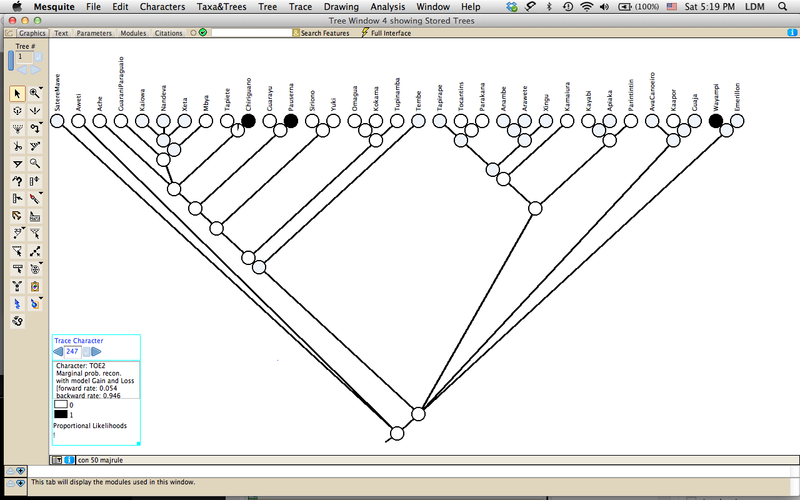 This is actually a pretty credible TG tree (although it may not, of course, be entirely correct): it largely reproduces the basic groups of Rodrigues (1984/5) and the proposed subgroups of Rodrigues and Cabral (2002), along with additional structure that seems plausible if you have, like us, been spending a lot of time looking at TG lexical and morphological data. (It also yields a very sensible model for the geographical dispersal of the family, but that’s a matter for another day.) One weakness of the phylogenetic result, however, is the support values for certain subgroups. Support values correspond roughly to the probability that a given subgroup is, in fact, a subgroup, and we have wanted to use a value of 0.85 as our cutoff point for considering a clade (or subgroup) credible. Unfortunately, some of our most interesting subgroups have lower values. For example, the subgroup that corresponds the more or less to Groups I+II+III in the Rodrigues classification has a support value of 0.81. Fortunately, one can increase the support values by improving the reliability of the cognate sets (assuming that they are not already perfect — ha ha). Computationally, lowered support values arise from ‘conflicting signals’, i.e. different sets of evidence that point to different subgroups. So, for example, there is good evidence for our Group I+II+III subgroup, i.e. cognate sets that uniquely define this subgroup, but there are other cognate sets that lead one to want to include other languages in this larger subgroup, or languages from this subgroup in other subgroups, reducing support the support for all of the subgroups. This kind of conflicting signal can arise from a number of sources, but two important ones are: 1) independent innovations that yield false cognacy; and 2) mistakes in building cognate sets, where two elements are deemed to be cognate when they are not. The latter issue is, of course, always a potential issue at this stage in the process, i.e. before complete application of the Comparative Method, since without adequate knowledge of the relevant sound changes, it is possible to treat bogus look-alikes as cognate, and miss true cognates due to changes that obscure cognacy. And in dealing with such a large dataset, human error inevtiably comes into play: forms are deemed cognate in the wee hours of a particular morning, which really aren’t credibly cognate by the cold light of day. 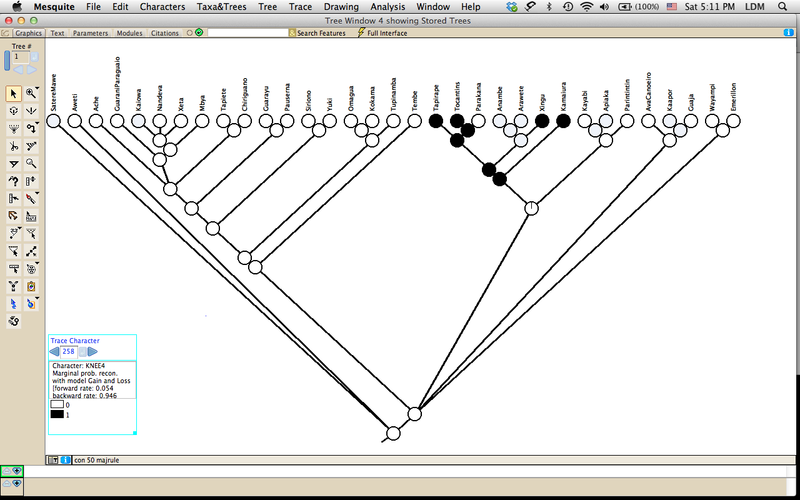 Fortunately, we have found a very useful tool for ferreting out potentially bogus cognacy judgments in the form of Mesquite, an application that serves to carry out analyses on inferred phylogenetic trees. Mesquite has many functions, but the relevant one for our purposes is its ‘reconstruction’ of ancestral states. Basically what this function does is to ‘reconstruct’ (i.e. 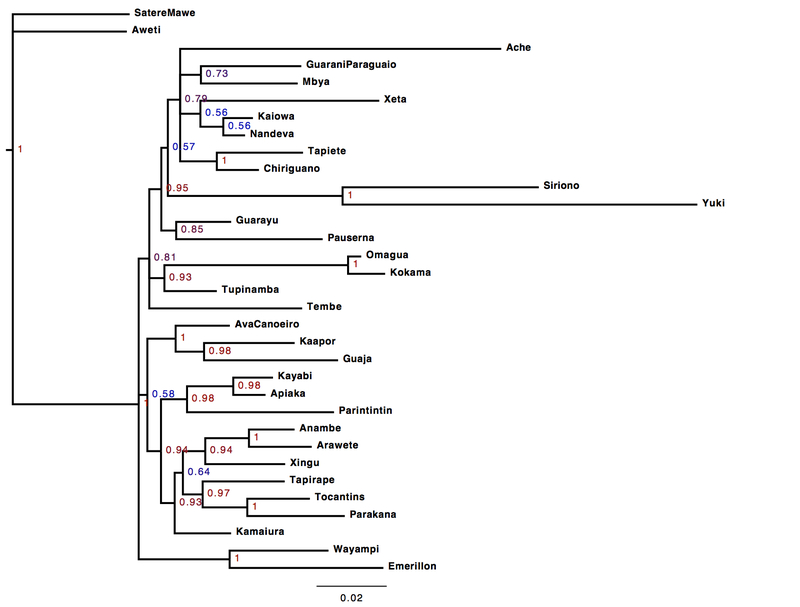 identify) how far back in a phylogenetic tree a given phylogenetic character (in our case, a form that is a member of a particular cognate set) reconstructs, according to the tree that one’s phylogenetics application has inferred. In doing so, it also identifies cases of independent innovation (likewise, according to the inferred tree). One thing that makes Mesquite especially nice is that it has a nice graphical interface that allows one to easily spot instances of independent innovation. First, in the following screen shot, one can see a nice instance of a character (KNEE4, presence of forms for ‘knee’ cognate to, e.g. Assuriní de Tocantíns kanawá), that seems to reconstruct quite solidly for one of the robust subgroups in our larger ‘Central’ subgroup. Next, in the following screen shot, one can see a character (TOE2) that was, according the ancestral state reconstruction associated with the tree, independently innovated three times: in Chiriguano, Pauserna, and Wayampí. This is a somewhat suspicious state of affairs, suggesting that it might make sense to look at the cognate set again. Doing so we see that the word for ‘toe’ in these languages is actually a compound meaning something like ‘foot head’. Body-part compounds with ‘head’ or ‘bone’ are fairly common in TG languages, suggesting that these forms for ‘toe’ are independently innovated, based on (true) cognates for ‘foot’ and ‘head’. On this basis we exclude this compound as informative for purposes of phylogenetic analysis. And note that pattern evident in the ‘reconstruction’ is precisely the kind of conflicting signal that might lower the support for subgroups like Central and Peripheral. Examining suspicious ‘reconstructions’ like the TOE2 one has led us to identify previously unnoticed complex forms, as in this case, as well as instances of poor cognacy judgments. And having identified several dozen problematic sets in this way, we have high hopes that our next TG tree will have the support values that we are pining for. We’re keeping our fingers crossed, and I’ll post our next set of results. Rodrigues, A. D. 1984/1985. Relações internas na família lingüística tupí-guaraní. Revista de Antropologia 27/28, 33–53. Rodrigues, A. D. and A. S. A. C. Cabral. 2002. Revendo a classificação interna da família tupí-guaraní. In A. S. A. C. Cabral and A. D. Rodrigues (eds. ), Línguas Indígenas Brasileiras: Fonologia, Gramática e História, pp. 327–337. Belém: Editora Universitária, Universidade Federal do Pará. *Current project members include Keith Bartolomei, Natalia Chousou-Polydori, Erin Donelly, and Zachary O’Hagan; alumni include Mike Roberts and Vivian Wauters. The work described here has been funded in part by NSF BCS #0966499 . Thanks also to Sebastian Drude and Françoise Rose for data-sharing!